How are values “taught?” How do we encourage young people to explore and develop values and the complementary social skills and attitudes that empower them to reach their potential? We would all like our own children as well as our students to be peaceful, respectful and honest. How can we let them know they can make a difference in this world and feel empowered to create and contribute? Students need many different skills if they are to be able to love values, commit to them, and have the social skills, cognitive discernment and understanding to carry those values with them into their life. It is with this intention that the LVE Theoretical Model and the Living Values Activities were constructed. LVE provides methods and activities for educators to actively engage and allow students the opportunity to explore, experience and express 12 universal values. After a few months of implementing LVE, dedicated educators find school cultures are infused with more communication, respect and caring. Often even students with very negative behaviors change dramatically. In an effort to understand why this approach works, some educators have asked to know more about LVE’s theoretical basis. What methods are used within LVE? 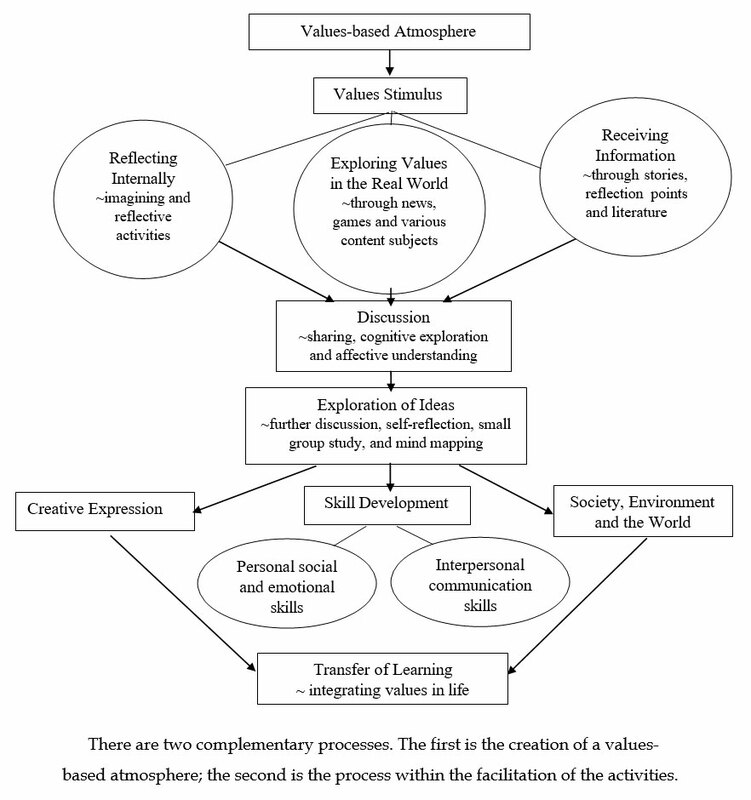 The schematic below describes the values exploration and development process. There are two complementary processes. The first is the creation of a values-based atmosphere; the second is the process within the facilitation of the activities.